Reopening of Newland Bridge on the A645 ' just one of the big projects completed in 2015. It’s been another challenging year for local government, East Riding of Yorkshire Council included, with the further cuts in central government funding. However, East Riding of Yorkshire Council – through its effective forward planning at the start of the economic downturn, continued strong financial management and use of new technology – has weathered the storm better than most and will continue to deliver high quality services for the public, despite the budget pressures we will face for at least another four years. We make no bones about it, things are going to be tough but we will be doing our utmost to achieve the huge savings we need to make in a carefully, planned manner rather than knee-jerk reactions. Despite the gloom of continued austerity, when I look back on 2015 what really strikes me is the amazing amount of investment we have managed to continue to make in local services and infrastructure and the top-class services we have delivered for residents, which has been acknowledged in numerous ways – from positive feedback from many of our residents and businesses to the council winning awards at a national level. All across the East Riding we have continued to invest huge sums of money into making facilities and services better for people and a good example of this is East Riding Leisure Haltemprice, which is a fantastic multi-million-pound facility housing a state-of-the-art leisure centre, a GP surgery, library and customer service centre. We’ve spent a million pounds in Driffield doing something similar, bringing different services under one roof in a building which will open next month and boast a new library, registry service and customer service centre. We started a massive £14million scheme this year to replace street lighting in the East Riding. Nine thousand new street lamp columns will be installed and 16,000 new energy-efficient lights fitted byMarch 7, 2019. We’ve spent a lot of money again on our roads network, repairing highways and improving routes and town centres, which we know is a huge priority for residents . Other big projects include improving school buildings around the East Riding, repairing Newland Bridge and a number of flood defence schemes. 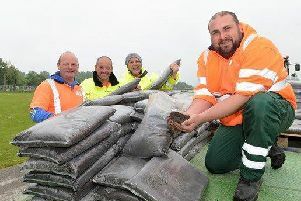 Flood protection work is another big concern of residents and businesses and we have projects in Willerby and Derringham, Leconfield and Cottingham, dredging the River Hull and supporting the Environment Agency’s coastal work. We’ve also supported our businesses and local economy in numerous ways, including the council’s High Street Fund, which has distributed tens of thousands of pounds to a variety of projects to boost our town centre’s prosperity. Looking ahead to next year, it’s already shaping up to be an exciting time for the East Riding. East Riding Leisure Bridlington is due to open in the summer of 2016 and will be an absolutely fantastic asset for the town. From the visits I’ve had so far, I can truly say it is breathtaking. As well as views to rival anywhere it will have the best swimming, play and leisure facilities and it will be a brilliant all-year-round attraction for residents and visitors. I can’t wait for it to open. The council is extremely proud of its investment and success with leisure centres and strongly believes that by spending money on them it can benefit thousands of people in terms of their health and wellbeing and also boost local economies and provide employment. Next year we’ve also got the return of the Tour de Yorkshire to look forward to, with Beverley hosting the start and Market Weighton and a number of villages also on the route of the first stage. It will be very interesting to see what happens with devolution. I’ve said many times that a Greater Yorkshire would be the best option, creating an economic powerhouse to compete on an international stage, but it remains to be seen what devolution deal will emerge. Looking further ahead into 2017, it’s the Hull City of Culture year and we wish all concerned the very best with that. Of course, the East Riding will be playing a significant part in the year-long celebrations, as a principal partner, and I expect many of our residents and venues to be involved, so next year we will be busy with preparations and gearing up for the big occasion. As you can see, challenges remain but there are also exciting times ahead.